Did everybody survive the Black Friday shopping mayhem? Hopefully you found all the best deals and knocked out a lot of your shopping list! I didn’t go out. Instead I started making some gifts that would also serve to bust my fabric stash. And, I saw something new from Nancy Zieman that is designed to help you get more comfortable with your serger. It’s a Serger Workshop & DVD that Humble Sewing Center can order for you. Anyway, Nancy Zieman shares a clip of her new dvd and I’m posting it here. Gotta tell you, it knocked me right on my rear. It’s showing a truly one-of-a-kind way to embellish your zippers that only the upper-line BabyLock sergers can do. I’m now experiencing serger envy!!! My old serger is a faithful friend and serves me very well but, she just can’t do this exclusive WAVE stitch from Babylock…… Technically, I could force my machine to do this stitch, but it’s kind of tricky to get it to turn out consistently or even pretty without using a BabyLock to do it. Soooo, check out this clip! I’m thinking of all the bags I make that could benefit from this embellishment technique…. Oh sigh! Some day! 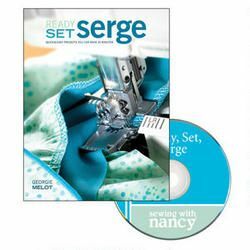 This entry was posted in Sergers, Video Library, Videos: Serger Tutorials & Tips and tagged serger, serger video on November 26, 2011 by Jenny Gabriel. What is a Serger & why would I want one??? 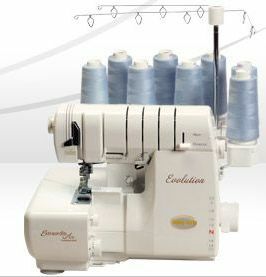 I recently put up a blog post with some shopping tips for sewing machines, embroidery machines, and also sergers. An old friend, new to sewing, asked me for some more information about sergers, so I decided to shed some light on these mystery machines here. The serger has a built in blade and lets you trim the seam allowance, stitch the seam, and overcast the raw edge simultaneously so you get done much quicker than with a conventional sewing machine. 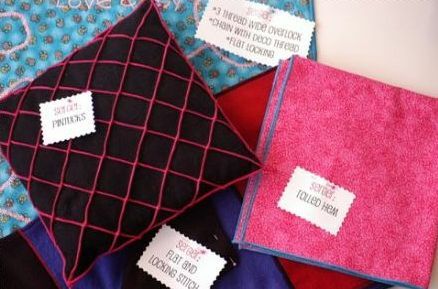 They also do decorative stitches that sewing machines cannot do and they have special settings that make it easier to sew on knits and tricky fabrics. If you’re just getting started sewing, you probably won’t need one of these right away. As you may have figured out, I’m a fan of Nancy Zieman’s show, “Sewing with Nancy,” and I like to post some of her video clips here. In the clip below, Nancy does a great job of showcasing the “Queen of all Sergers,” the Babylock Evolution. Even though I don’t have the Evolution, watching the clip just now, reminds me why I love my trusty serger so much! It’s full of easy projects that also make great gifts. Humble Sewing Center carries this one and you can find it online as well. This entry was posted in Featured Machines & Cabinets, Good Books I've Found!, Sergers, Tips/Techniques FYI, Video Library, Videos: Serger Tutorials & Tips and tagged gift ideas, serger video on November 15, 2011 by sewvacoutletblog. Holiday Home Decor – Serged Christmas Tree Napkin! Have fun watching the how-to video for making your own serger Christmas Tree napkins! These make for easy and attractive table top decor as well as a thoughtful gift for a co-worker or loved one! This entry was posted in Featured Machines & Cabinets, Home Decor, Project Tutorials, Sergers, Video Library, Videos: Serger Tutorials & Tips and tagged home decor, napkin tutorial, pattern making, serger, serger project, serger video, sewing lesson on November 2, 2011 by sewvacoutletblog.